Volkswagen recalls 169 vehicles to replace the rear seat frames. December 10, 2018 — Volkswagen is recalling 169 vehicles because the rear seat frame head restraint guide sleeves may not be welded correctly to the seat frames. Recalled are 2018 Volkswagen e-Golf, Golf R, Audi A3 Sedan and RS3 vehicles that need the rear seat frames replaced. The recall is expected to begin January 11, 2019. 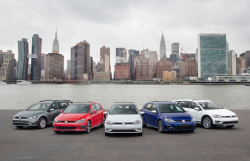 Volkswagen e-Golf and Golf R customers may call 800-893-5298, and Audi A3 and RS3 customers with questions should call 800-253-2834. VW's recall number is 72H8 and 72H9 is the recall number for Audi. CarComplaints.com has complaints about the VW e-Golf, Golf R, Audi A3 and other Audi vehicles.